A simple percentage breakdown of mass inputs and outputs. 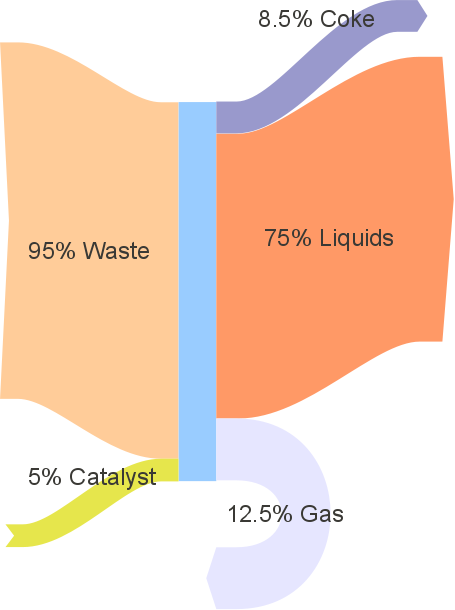 Even though it only has 5 arrows (2 in, 3 out) there is an error in this Sankey diagram. Who can spot it? First commenter to tell the answer will get a honorable mention. That’s like totally almost 100%, man. Absolutely right, Shalom, this is the obvious error in the diagram!! Congrats. Maybe the other 4% is a unidentified loss in the system? Michael, that’s possible. But then the stacked arrows on the left and on the right hand side of the center shouldn’t have the same height, should they? Catalyst should be in right side too, it can’t be used in reaction (as I understand). Actually, it is a diagram which is used in my last assignment and we should calculate the unknown output in that question.